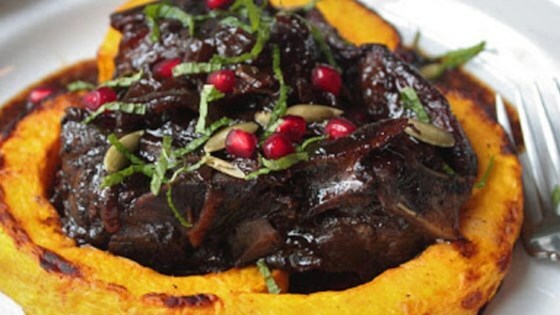 "This pomegranate braised lamb shoulder is about as seasonally appropriate as it gets, and one of the best things I've tasted in a long time." Preheat oven to 300 degrees F (150 degrees C). Generously season lamb chops with salt and black pepper. Cook in the preheated oven until meat is fork tender, about 2 hours. Transfer lamb to a plate and set Dutch oven on the stovetop over high heat. Bring pomegranate mixture to a boil; cook, skimming any fat that accumulates, until liquid is reduced by 1/3, about 5 minutes. Made this for my boyfriend. He loved it! Very tender and juicy. Paired it with butternut squash for a nice fall dinner. This recipe is awesome and other than getting the seeds out of the pomegranate, it was pretty easy!